From Goodreads: It is 1939. The scourge that is Nazi Germany is trampling Europe as its scientists vie to deliver ever-increasing destructive power. Now physicist Walter Friedeman – a friend of Albert Einstein’s since childhood – has found a formula to enrich uranium in three months rather than the previously expected five years. Such a formula could deliver Germany the first atomic arsenal. But Friedeman does not believe in the Nazi cause. Friedeman wants the formula in the hands of America, but getting it to them himself will be nearly impossible. He sets into motion a plan to use his teenaged son, a Hitler Youth, to unwittingly do the job using a message Friedeman has encoded in the Elvish language created by J.R.R. Tolkien in his novel The Hobbit. What follows is a quest across continents as Einstein, Tolkien, and MI-6 officer Ian Fleming work together to find Friedeman’s son, decode the message, and wrest control of the nuclear future before Hitler can steal it for himself. Reuniting Tolkien and Fleming after their adventure in No Dawn for Men, God’s Formula is a heart-pounding thriller filled with history both real and imagined. James LePore and Carlos Davis are back with another riveting tale of espionage surrounding Nazi Germany and Tolkien’s famous novel, The Hobbit. 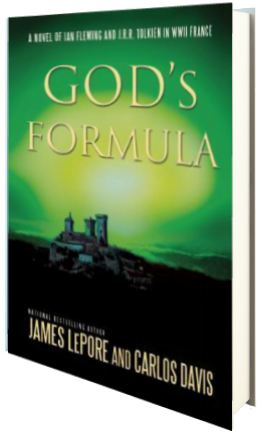 If you’ve read No Dawn for Men, then you already know God’s Formula is going to be a riveting read. And riveting it is—told in chapter format specific to date and time, readers are whisked away to Germany, the United States, England, and beyond as we follow multiple characters through the pages, intertwining with their stories until they collide, leaving us breathless in anticipation as the plot thickens. I truly love how this story builds suspense; jumping from character to character, situation to situation always leaves me on pins and needles, and I thought it was extremely easy to keep track of all the characters, since LePore and Davis do such a wonderful job fleshing them all out and making them realistic in my mind. The fact that the novel is peppered with real people—real famous people—such as Einstein, Tolkien, and Fleming also adds a bit of fun to it all, dire circumstances and all. And while God’s Formula does bring together some old favorites from No Dawn for Men, God’s Formula is more of a companion novel, and not a sequel; it can definitely be read as a standalone if you so choose. Though I really do suggest reading both novels because they’re both absolutely intriguing, especially as they combine fact with fiction, leaving readers pondering the aged old question, “what if…” As the final chapter in The Hobbit saga readies for release in the theatric world, now is the perfect time to pick up God’s Formula and see how masterfully LePore and Davis weave fact and fiction together. Four stars. I received this novel from the author and publisher in exchange for an honest review. 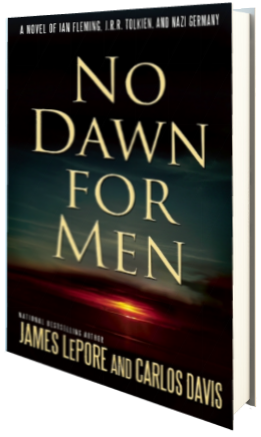 Read my review of No Dawn For Men HERE.